Why Do I Spit a Lot When Jogging? Many runners develop excessive saliva or mucus while jogging. This causes them to spit much more during their training than they normally would. A jogger might feel like spitting more during a workout for any of several reasons. Because a body in motion is under a variety of stresses, more saliva or mucus will be produced and, therefore, will need to be expectorated. When running outside in cooler temperatures, your nose must warm and humidify the air you breathe before it reaches your lungs. This action produces mucus in your nose and throat, and the mucus acts as a humidifier to condition the air before it reaches your lungs. The buildup of saliva and mucus will cause you to spit more often. The production of saliva increases when runners begin working their lungs and cardiovascular system. As the body warms up, it will produce more saliva. This affects people differently and might affect newer runners more than exceptionally fit joggers. Joggers who smoke or who have recently quit smoking will produce more mucous as their lungs work to clean themselves during exertion. When outdoors, runners with even mild allergies might notice they are producing more saliva or mucus. Seasonal allergies can cause runners to wheeze and suffer from runny noses and watery eyes. When pollen counts are high, joggers will notice increased mucus production and might experience difficulty breathing during their workouts. Placing the respiratory system under stress from jogging exacerbates allergies and creates the need to spit as post-nasal drip enters the back of the throat. Plan your workouts for when pollen counts are lower during the day. Windy days also can intensify allergic reactions, leading to an increased desire to spit while jogging. Some medications can cause increased saliva production, which might become exacerbated when jogging. If you are on a medication that is causing you to generate excess saliva, you might find that physical exertion will accelerate the side effect, causing you to have to spit more when you are jogging. Check with your doctor if you have such a reaction while taking a medication and ask for suggestions to reduce the side effect of excessive saliva or mucus production. The fluid produced for some will be thin and watery, while others might experience a thicker, stringy mucus that could affect performance and breathing while jogging. 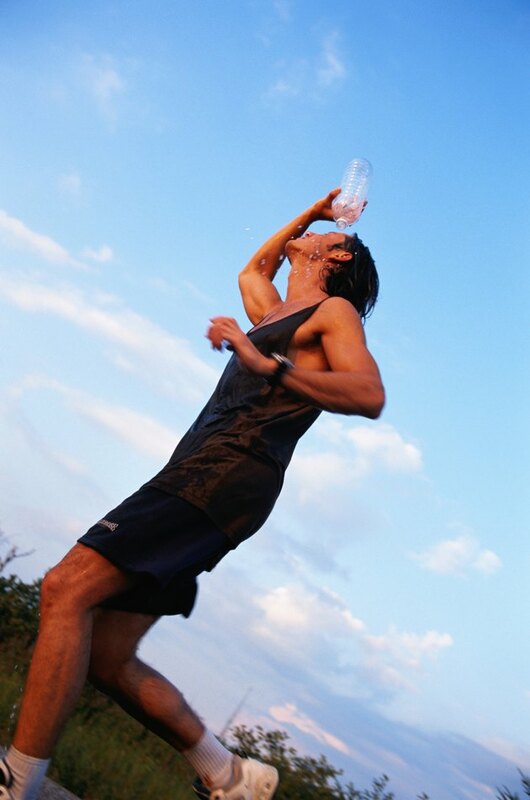 To alleviate the condition, carry a bottle of water or a sports drink and take frequent sips to prevent dehydration. Swish around small amounts of the drink in your mouth every 10 minutes or so, but do not take large gulps. RiversideOnline.com: "Postnasal drip: Common companion to a runny nose"
ACSM.org: "Exercising with Allergies and Asthma"